Panda Systems Management is the easy and affordable way to manage, monitor and maintain all your organization's devices, whether they are in the office or remote. Thanks to the simplicity offered by the pre-configured settings, the learning curve is practically non-existent, and it ensures that the organization's IT infrastructure operates exactly according to plan. 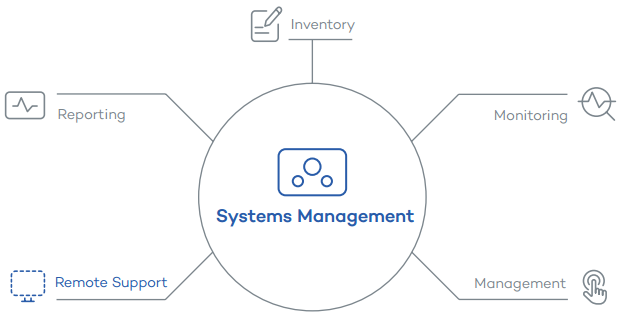 Why opt for System Management? Systems Management allows simple and affordable management, monitoring and support of all the devices in your company, whether they are in the office or on the move. Resolve your users' problems proactively by remotely and non-intrusively accessing their computers and devices, wherever they are. Twofactor authentication to verify identities. Encrypted communication with the server. Monitor use of CPU, memory and hard disks, printers low on ink etc., with real-time graphs and alerts. Create your own scripts or download them from our ComStore. You can also modify them to suit your needs and launch them. Automate the deployment of updates and patches for the software installed. Centrally deploy software and updates. 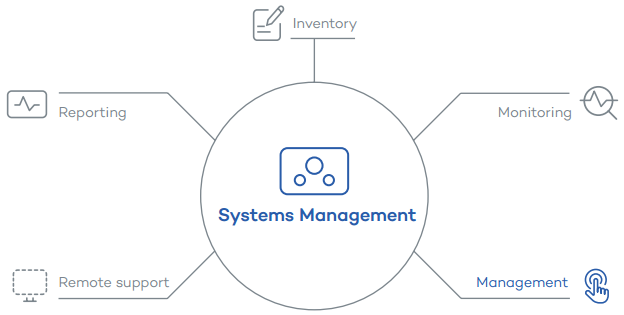 Systems Management allows you to optimize the functioning of your IT infrastructure thanks to its automated management and centralized control. Organize, classify and prioritize incident troubleshooting. Share and reuse technical procedures to resolve incidents. Establish password policies, control over use of the device, remote connectivity settings, remote locking and data wiping. FISMA, SAS70, ISO 27001 and PCI DSS. Ensure the security of the service through encrypted connections between the devices and the server. Secure access to the administration console through two-factor authentication in order to check the identity of the administrator. 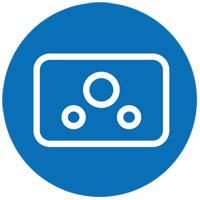 With Systems Management, you can remotely access the desktop of the computers on the corporate network (shared access or total control). Users can also open tickets to ask for help or communicate directly with the IT department through the messaging and chat system. Systems Management integrates control and management of mobile devices in a single tool. Prevent data loss on stolen devices through password-based security and remote wiping. Find lost or stolen devices and control the apps installed on each device. Do you have 100% permanent visibility of all hardware and software on your IT estate? With dispersed offices around the country, and with an ever increasing number of road warriors and home workers, it’s really difficult to know what you’ve got out there. However, due to compliancy issues, annual budgeting and “one off” projects, you need to be able to locate that information quickly, without having to send technicians from one office to another, filling excel sheets. 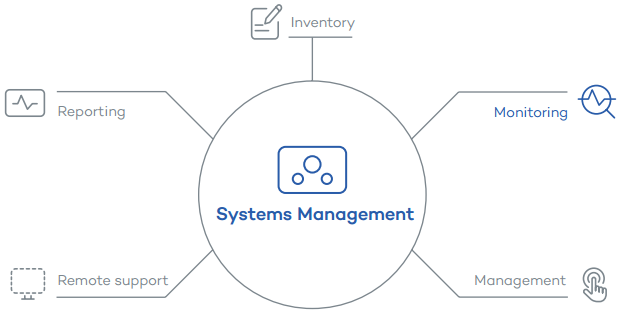 Systems Management Inventory module will provide you with permanent up-to-date information and complete visibility of all your IT devices. How many “once off” tasks does your IT dept run per year related to software / hardware? Whether it is for a compliancy audit or budgeting for your HW for the next year these tasks are generally time consuming. With Systems Management you can access all hardware and software centrally for one, some or all devices. Quickly get a global view of your entire IT estate form one dashboard. See how many devices are online / offline. How many devices are not protected by Antivirus / Firewall?. How many patches your system is missing? Define thresholds for software licenses to ensure you are not exceeding your limit and identify which specific devices have the software in question installed. How much energy is your IT system consuming? From the energy usage audit not only can you see what you have got you can also see how much energy it is consuming and how much that energy is costing your company. Drill down and see how much each specific device costs. This can help you to implement and track green initiatives in your company. How much time is generally spent on diagnosing end user issues? Over email or by the phone the general question is “What did you do to your PC?” to which the answer is generally “nothing, honest!” The change log will show you all systems, hardware and software changes expediting troubleshooting by identifying incident triggers in a fraction of the time. Control what software is installed on which devices. Define and control what software can and cannot be used on one, some or all devices. Expedite problem diagnostics by getting all information on your hardware/software and system changes for each device at a glance. If your IT Dept. receives an email or phone call about a server outage or a PC that isn’t working properly, it’s already too late, your company productivity is already affected and the costs are accumulating quickly. Companies are more IT dependent than ever. From email programs & applications that affect your employees’ productivity to important financial data on your servers that can potentially damage your company’s reputation or affect your bottom line. Waiting for the phone to ring is not enough!. Systems Management anticipates problems proactively, monitoring device activity through alerts, dashboards, graphs, tickets, etc. This lets you detect incidents and manage time efficiently, automatically allocating them to your IT staff and documenting all actions. This is the only way to improve your response time and prevent major problems that impact negatively your company’s performance and finances. One step ahead of the problem! Knowing if something has gone wrong means you can reduce the impact of the problem, knowing if something is going to go wrong means you can avoid it altogether. Establish monitors / alerts to track your IT systems performance and identify issues before they become problems. If something has gone wrong on your IT system (server crash) or if something is going to go wrong (possible disk failure), knowing about it in real-time is a must have and not a “nice to have”. With Systems Management, you can set warnings and thresholds for your most important assets and schedule the tasks required to resolve issues proactively. Do not just establish what you should monitor; establish how your system should respond in the case of an issue. So whether it is starting your backup service when it stops or bringing a machine online when it has gone offline you define how your system should respond automatically to a given issue. Sooner or later incidents build up and technicians have difficulty in prioritizing them and assigning them to department staff. Moreover, many incidents are quite similar and often require responses already known to the technicians that dealt with them. The tickets system ensures reduced response time and optimizes the operation of the IT department. Email is one of the most important communication tools in today’s companies and when that stops the impact can be disastrous. Monitor the most important mail server variables such as queue size, database size etc and preempt email downtime. Ensure correct backup execution and avoid data loss by establishing back up monitors. Automatically and in real time monitor that the backup service is installed, running and has been executed in a defined time frame. Monitor low disk space, CPU usage, memory usage and the status of all your computers, ensuring optimum performance. Keep on running! Keep your servers running by monitoring those critical services which keep your business working perfectly. Define how your system should respond if an alert is triggered; restart services, launch a script, etc. Creation of tickets to manage incidents and ensure they are allocated efficiently across your technical team, encouraging exchange of information and re-use of technical procedures. The challenges associated with managing an ever more complex and dispersed IT infrastructure are becoming harder and harder. Today, IT administrators have to manage a wide variety of devices. They have to deal with the need to constantly change and upgrade software for maximum productivity, security and stability. All of this with an ever-growing dispersed workforce who can now work from the office, from home, from the airport, etc. 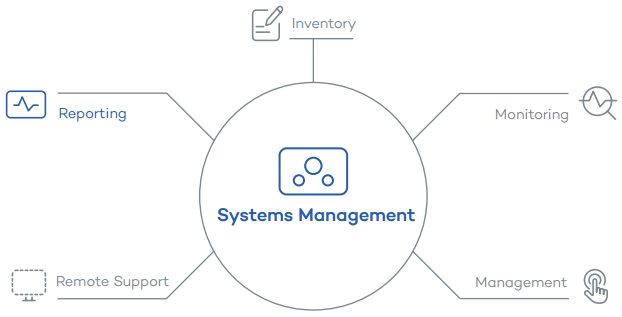 As Gartner says, “Effective management can cut total cost of ownership for desktop PCs by 42 percent.” With Systems Management you can centrally automate critical tasks, saving time and money. Improve your security by keeping software and patches up-to date. Ensuring all devices you manage are up to date and secure directly and dramatically reduces the number of device incidents while also reducing the impact of downtime. Making sure your machines are patched is a must have but also a difficult task to manage in companies that have dispersed offices and mobile staff. Create Microsoft patch policies for one, some or all your devices regardless of if they are on the LAN or not. Patches can also be rollout on demand or scheduled. Whether it is your internal CRM application, a program for your finance department or MS Office for administration; it needs to be deployed and updated. Centrally deploy and update all your companies’ software and track all deploys to ensure they have run correctly, regardless if the device is on the LAN or on the road. Keeping your operating systems up to date is critical but so too is managing the update of 3rd party software such as browsers, Adobe, Flash, Java etc. From our Comstore you can download from our ever extending range of 3rd party software and distribute directly to a device (s) or schedule the deploy / update. Centralizing scripts on one platform means that technicians can collaborate and use the same tools. You can directly create scripts in multiple languages and make them available to all technicians. Define how your devices should power off and use energy more efficiently. Schedule shutdown, sleep and hibernation times for one, some or all devices. In addition, define times for turning off hard disks, displays etc. Do this in seconds and measure the impact on you energy usage via the Energy Audit report. Reduce the overall number of incidents by ensuring your devices are running smoothly. Schedule regular health checks, such as memory checks, disk checks, disk fragmentation and monitor the results to guarantee that everything runs smoothly. Ensure your devices have the latest updates and patches keeping them in good health. Build your own scripts or download prepared, prepackaged scripts from our component store, and launch them with a single click of a button, schedule or as an automatic response to an alert. Centrally deploy and upgrade software, ensuring your environment has the most secure and stable version available. Ensure the highest levels of security, stability & productivity for end users. Go Green and optimize your IT carbon footprint. The challenge: The mobility of today’s workforce and the wide variety of mobile device platforms available make control and management significantly more difficult. The use of mobile devices in the business world is clearly on the rise. Not only that, according to The Times, with the appearance of smartphones and tablets the average number of mobile devices business executives use rose to 3.4 in 2012. As if this was not enough, the existence of multiple mobile platforms competing for the same niche market has made network management even harder and fostered the appearance of fragmented management solutions with very different functionalities. The solution: A single, cloud-based mobile device management solution for your entire organization. Systems Management lets you manage your Android and iOS devices, both in the office and on the road, from a single Web-based console accessible anywhere, anytime. Log software and hardware changes on mobile devices and generate reports on the status of your mobile fleet. For centrally managing all your Windows and Mac OS X laptops (netbooks, ultrabooks, etc), tablets, Android and iOS smartphones, both in the office and on the road, anywhere, anytime. Hardware and software installed, changelogs, operating system and version, operator, total capacity and free space in internal drives, etc. Showing the status of all devices on your network, including smartphones, tablets and laptops. Quite often, when problems arise, troubleshooting is intrusive for end users. Support technicians must travel or connect to devices, taking control of them and directly and negatively affecting end-user productivity. With Systems Management, technicians can remotely connect to the devices, even if they are switched off, run diagnostics and resolve issues transparently for end users, wherever they are. The console includes built-in remote access tools that provide access to devices in the background. In addition, it allows you to run commands, view and manage event logs, registry entries, services and transfer files without disturbing users. All you need is an Internet connection and to install the agent in order to access end-user devices remotely, regardless of whether the device is switched off and no matter the location of the device or the administrator. How long does it usually take you to connect to a remote machine from the time you know a problem exists? What happens if the device is switched off and the office deserted? With Systems Management, simply click the Wake on Lan option and you can connect directly to the device remotely, with no need for additional software or downloads. You or other technicians can establish as many remote connections as you need without the fear of disconnecting other sessions due to concurrent session limitations. You can take over the end users session, like the majority of remote control software, or you can connect non-intrusively in the background. While connected in the background you can identify the problem and resolve it without the end user ever knowing you were connected and what’s more important without ever affecting his / her productivity. You can take remediation action by using the command shell, killing processes, restarting services etc but also by directly accessing all your applications; software, scripts. You can also shutdown or restart the device, normally or in safe mode all remotely. You can chat to the end user using the realtime chat option and also take notes on the connection which are saved to the devices information for future reference. Start your devices remotely and access them wherever they are. Task manager, file transfer, registry editor, event log viewer... Builtin remote tools let you fix multiple devices without interrupting users. Desktop access shared with the user or full control. You can also chat with the end user. Assign and track incidents supporting documentation with the ticket system. It is useless to provide users with the best service if they don’t notice it and even complain about IT technicians. How many times have you been told that it takes too long for you to resolve incidents? How many users would feel more satisfied if they knew what you actually do for them? Also, how can you show the value of your work to your IT Director? With the detailed and measurable reports of Systems Management, you can justify the time spent and show all the actions you have taken remotely, preventing and managing problems. While you are deploying software, updating patches, executing scripts and connecting remotely to devices, too mention but a few, all that information is tracked and stored so you can leverage it later in your reports. Remotely managing, monitoring and supporting your IT estate can be difficult to demonstrate as it would appear that everything runs smoothly by itself. Using a wide range of reports you can get unique insights into your IT system and quickly show why your IT system is running smoothly. Schedule your most commonly needed reports such as weekly activity reports or health checks and configure the report to be sent to key stakeholders via email periodically. You can also respond to once off requests for IT information by creating on demand reports in closed or open formats which can complement other documents. Keep track of all your support activities. Identify quickly how many jobs have been done (software installations, health checks etc. ), remote support sessions and which technicians executed them and when. Lets you know exactly what software your end users have installed, updated or deleted. You will also know the version in question and the date and time of the action. Quickly identify the devices that are running out of space with this graphical report on storage usage on the various devices and each drive. Identify which alerts (e.g. a certain service stopped) have been triggered and on which devices, if there was a response to the alert and the average time of the response. This report also gives you insight into the devices that are most problematic. See your network activity in detail: remote connections, software installation, patches installed, bandwidth consumption, etc. Email on-demand or scheduled reports. Make a list of all devices within your network: name, IP address, hardware and software name, etc. Generate network status summaries. Find out which operating systems and software users have on their PCs (quantity & type). Windows Vista 32/64-bit (Starter, Home Basic & Premium, Business, Enterprise, Ultimate). Windows Server 2003 & R2 32/64-bit (Web, Standard, Enterprise, Datacenter, Small Business, Home Server). Windows 7 (32-bit & 64-bit editions) Windows 8/8.1 (32-bit & 64-bit editions) Windows 10. Windows 2008 & R2 32/64-bit (Standard, Enterprise, Datacenter, Web, Small Business). Windows Server 2012 (64-bit) & Windows Server 2012 R2.